The White House Ornament Collection presents the Official 2001 White House Andrew Johnson Ornament. 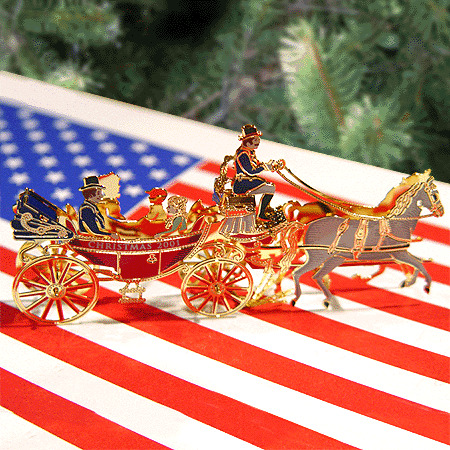 The 2001 Christmas ornament features a reproduction of the type of carriage used by Andrew Johnson, 17th President of the United States of America. After long days in the White House, Andrew Johnson often took his family on carriage rides to spend time with them. This year's ornament depicts Johnson's carriage returning to the White House at Christmas in 1867. Beautifully crafted, the 2001 Andrew Johnson Christmas Ornament has a 24kt. gold finish and eight rich colors.